On June 6, 1944, US Airborne Divisions parachuted into Normandy, France. As anti-aircraft fire blazed in the night sky, the Paratroops were scattered far and wide, leading to the greatest skirmish warfare engagement in history – the invasion of Germany’s Atlantic Wall had begun. 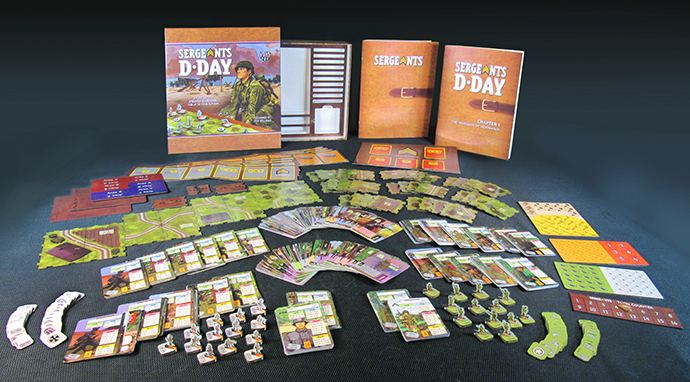 Sergeants D-Day puts you in the action commanding a squad of soldiers, adapting to the changing situation. Your men are a collection of strangers; as you learn their names, you also learn how they perform in combat. No game plays the same, no squad is the same, and the story you write is the only one that matters. Vacuum-Form Tray to keep your squads organized. Sergeants D Day is a great game. It plays very similar to its big brother, Sergeants Miniatures Game, but on a smaller map scale. My wife and I have played it on a small hotel room table. I recently ran through the game at a convention and new players had it down during turn one. Be sure to pick up extra soldiers and expansions. You will certainly want them. 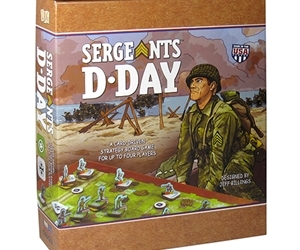 Sergeants is a great system and Sergeants D Day offers another great product from Lost Battalion Games.